He was Too Much Horse in the beginning. Kris Hazelbaker got Jaziret Bey Musc as a weanling from breeder Kathy Ann Judson, but as a 5-year-old, he was still too much horse for Kris. Kris contacted Steph Teeter and asked if she was interested in a big heavyweight horse. "At the time I had Krusty (Nature's Kruschev, Steph's internationally competitive endurance horse), so I thought of (neighbor) Rick Brand, whose regular horse had lameness issues," Steph says. "They went to look at Rhett, and got him in the trailer - that was the first time he'd been in a trailer - and took him home. Then Rick started 'doing Rhett' - which is great, because I don't think anybody else could have 'done' Rhett." "He was way too much horse for me, too!" says Carol Brand, Rick's wife. "Rick rode him for about a year before I ever got near him. 'Get him away from me!' I'd said. I didn't want anything to do with that horse!" 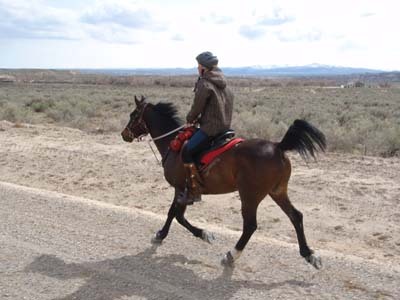 Rhett's first 2 endurance rides were LD's in Idaho at the age of 7. His first 50-mile endurance ride 2 months later was not just a 50-mile ride - it was all 5 days in a row (265 miles) of the legendary and challenging Outlaw Trail in Utah. On Day 1, Rhett almost drowned in a bog. "We were trying to get him out," Carol recounts. "He was going down for the third time, went clear under the mud with his head, and he was exhausted, and wasn't fighting anymore. And then 3 other riders came along, and we took apart everybody's tack, and made a lasso, and all 5 of us drug him out of the bog. "And the next day he was fine. The saddle was all screwed up, still wet and covered with slime, but we put it on him, and off we went!" Rhett and Rick ended up winning top Heavyweight honors for the 5-day ride. Rick partnered with Rhett for 2 full seasons - 14 of 14 rides and 615 miles - before Carol finally rode him on a 50 at the end of Rhett's 8-year-old year. 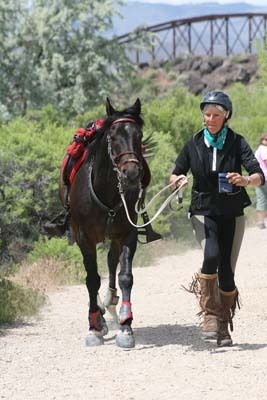 When Rick started having back issues, Carol rode Rhett the next season to 4 of 4 completions, including Rhett's first 100-mile ride, an 8th place finish at the Mt Adams National Championship Qualifier. When asked what her impressions of him were, Carol says, "He was an amazing powerhouse and you had the feeling that he could do absolutely anything, which has turned out to be quite true. Those were truly the best rides of my life. Rhett has always been my “10” of all the endurance horses I have ridden. All of the horses that came after had some very large (#2) shoes to fill!" 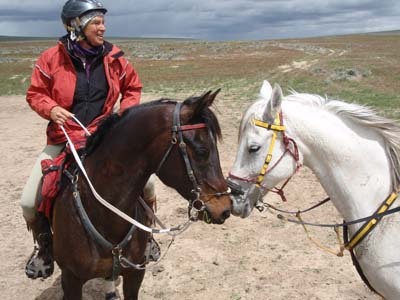 Carol enjoyed riding Rhett, but she had her own horses to ride, and Rick still had back problems, so they decided to sell Rhett. Steph Teeter suggested some FEI riders who might be interested in him, and it was multiple World Endurance Champion Valerie Kanavy who expressed an interest in buying Rhett, if she could see a video of him first, before she drove across the country to pick him up. "I decided I'd have Steph to ride him for the video, and I hired a videographer," Carol says. "When the day came for making the video, the weather was just awful. It was raining, and thundering and lightning. I had Rhett caught up, and he was running around doing laps in his pen away from his friends, and just was like a complete fire breathing dragon, and i didn't want to have anything to do with him! "That's when Steph drove up, and looked at him, and she said, 'I Want That Horse! He's MINE!'" Steph doesn't describe the thunder and lightning and the fire breathing dragon, but she does recall calling off the video shoot, saying "I'm going to buy him!" She'd ridden the Mt Adams 100-miler alongside Carol and Rhett, and she remembered he was "just amazing"; and something about Rhett that day at the Brands sealed the deal for Steph. And Rhett has been absolutely amazing, and snorty, and All Go, since then, adding another 4000 miles, and some very unforgettable rides for Steph over the next 13 years. "Probably one of the most memorable is the 2001 XP (the cross-country Pony Express ride put on only a handful of times by the Duck)." The first day on the XP was just Steph's third ride on Rhett. "For 1 month, Rhett rode every other day, 500 miles total. He just did it, and I was holding him back the whole time. Literally!" 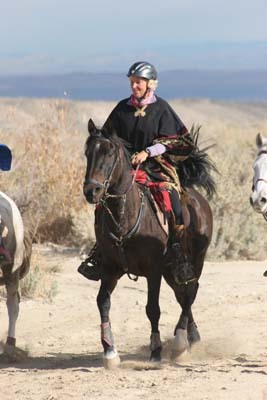 Then there was July of 2010, that Steph got a whim a week before the 100-mile Tevis Cup, to enter Rhett. He was 19 years old that year. 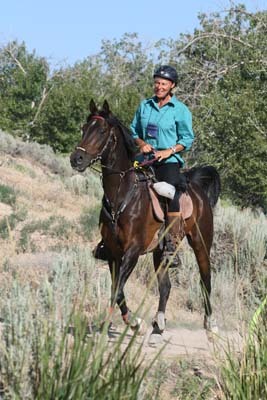 Rhett got his 5000 miles in completing his first attempt at the Tevis. "He was amazing!" Steph said in tears, after they crossed the finish line at 4:58 AM. "He never ever didn't give!" And then, there was the local 50-mile Owyhee Fandango just this May, that Steph herself put on. "The other most memorable ride, really, was the last one I did on him at Fandango, with [husband] John on Sunny - we Top Tenned, just - WHOOSH - I cried at the end. I mean - THAT HORSE! That was really amazing. That was a high!" That horse is now 22 years old. By Scooter Bey Musc (of the Muscat lines) out of Justy Karliya, by Witez, Jaziret Bey Musc is nearly all Russian, with a little Polish. He's 15.2 hands, superbly steady and purely athletic, with enormous feet (size 2.5 Easyboot gloves) and good bone. Through May of 2013, he's completed 121 of 128 rides with 6 Best Condition awards, and 9 of 12 100-milers. He's got a little gray hair hiding underneath his forelock now, but his body is still magnificently conditioned. It's not only the Brands and Steph Teeter that Rhett has impressed. He has carried 15 other riders on endurance rides (including Canadians, Belgians, and an Argentinean), and countless others on training rides, and left them all with fond memories. "A warrior like I like them, just up to the rider to manage his temperament and extreme courage!" said Belgian Leonard Liesens. "A true athlete," Carrie Johnson said. "He was in a league all his own," Connie Holloway commented. 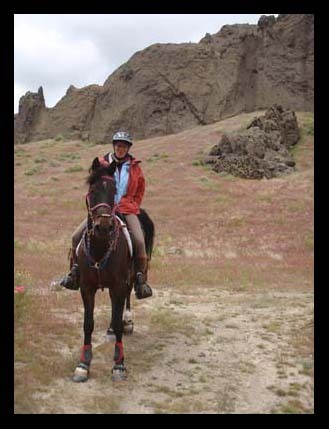 Rhett was one of the first endurance mounts I rode in Idaho. I found him powerful, athletic, and extremely balanced beneath me, and All Go. You still don't ride him in anything other than a 3-ring bit. At 22, even though he is roughly the equivalent of a 60-year-old man, he is still all of that, with no indication he'll change any time soon. 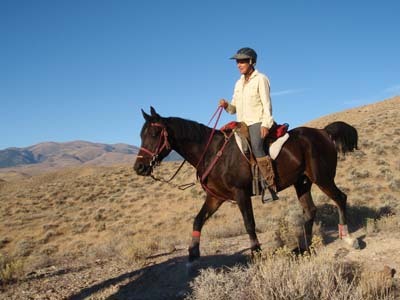 So if you're out on the trails and hear a fast horse coming up behind you, and you see a dark bay with an All Go gleam in his eye and a tail that characteristically waves high in the air like a flag (a silhouette that is unmistakable, even across mile and miles of desert), you'll know that Rhett is still burning up the endurance trails. And he's still too much horse: Steph will still be holding him back. I couldn't help myself and I did his percentages because the 'nearly all Russian, with a little Polish' didn't sound quite right to me. So...the little Polish part is correct - about 13.28% roughly, and almost all of it from Witez except for the Aramus. I would expect that's where most of the 'hot' comes from. However, there's more Crabbet in there than Russian by a good bit - officially 49.54376% Crabbet (using the Eastern Crabbet Society's spreadsheet) and only about 37% Russian - and all of that is through Muscat and Nariadni but both of them also have Crabbet blood behind them although ECAHS is probably the only people who recognize that since they were both born in Russia. There's also a bit of Babson way back on his dam's side but that's probably less than 1% of him all together. This horse should be in the AERC Hall of Fame! I hope he is nominated -- QUICK, someone nominate him! What a beautiful example of a fine Arabian charger. Literally. Steph was the perfect match for him, too. Love. What a great story on this incredible Arabian!! Thank You Merri for Rhett's story. 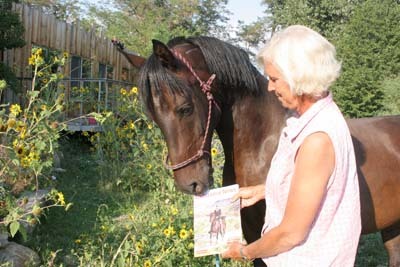 As his breeder it was wonderful to read. them so much. Rhett's 3/4 sister blessed us with a stunning colt in May that is a major hotrod. I was 19 when I bought Rhett's grandmother Jaliya. Jaliya was amazing, a V8 with the throttle wide open. That intense power and drive is a family tradition generation after generation. Buckle your seatbelt and hold on for an unforgettable ride.